This x-ray of a 48 year old man 26 months after injury shows a persistent nonunion of the forearm despite multiple surgeries performed at outside facilities by other physicians. Notice that the forearm is also very crooked; the wrist and hand should be aligned with both long bones. 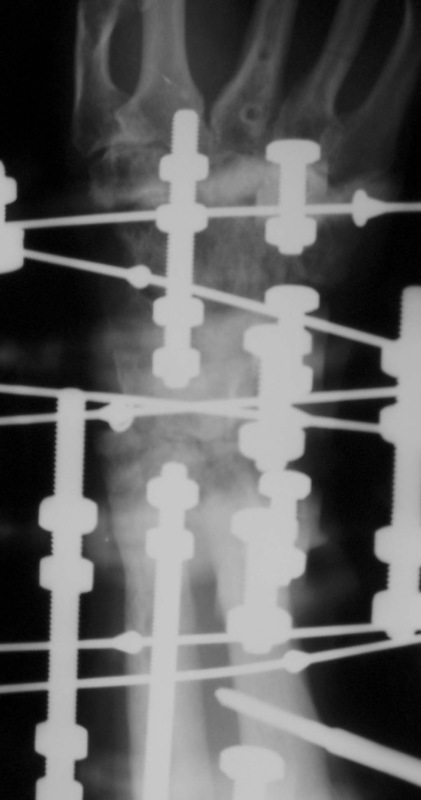 This nonunion with malalignment was causing considerable pain and disability. This image shows Ilizarov treatment using compression in progress. The Ilizarov treatment also simultaneously corrected the misalignment of the wrist. The final x-ray shows that the bone has healed solidly and wrist alignment with the forearm has been restored. The patient has no pain and has good use of his arm and hand.